Apple's customary "just one more thing" hasn't yet extended to the 'invention' of X-ray vision. 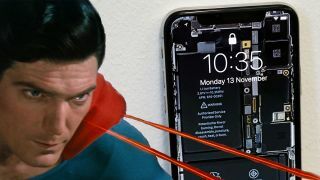 But if you're looking to ape Superman's most useful* super power, the iPhone X's lush screen can do a pretty good job of tricking your eyes into thinking it's possible. The team at iFixit, best known for its gadget teardowns, has put the exposed innards of the iPhone X to a good use beyond assessing its repairability factor. It's taken a high-resolution, ratio-perfect shot of the phone as if its screen were made invisible, letting you get a good look at the guts of Apple's latest and greatest. It's a clever use of the bezel-less display. The edge-to-edge OLED's 1125x2436 resolution is sharp and rich enough to, at a quick glance, make it genuinely seem like you're looking right into the internal workings of the smartphone. But, by virtue of some irremovable iOS lockscreen elements, it's not quite perfect – you'll still see the clock, battery and connectivity icons, as well as the quick launch app options. Want to give it a spin? Simply head over to the iFixit website, where you can save the image to apply as a wallpaper. You'll find the option in your Settings menu, under Wallpapers, where recently-saved images are provided as an option. Alternatively, open the image in your Photos app and under the 'sharing' icon is the option to set as a wallpaper. We recommend using it as the lock screen, as the icons on top don't look as good. It's perfect prank material too – should a trusting friend hand over their iPhone X for a few minutes, that'll give you plenty of time to make them think you've deconstructed their more-money-than-sense plaything.